Background: In developing countries, intravenous thrombolysis (IVT) is available at a limited number of centers. This study aimed to assess the feasibility and safety of IVT at Tabriz Imam Reza Hospital. Methods: In a prospective study, over a 55-month period, any patient at the hospital for whom stroke code had been activated was enrolled in the study. Data on demographic characteristics, stroke risk factors, admission blood pressure, blood tests, findings of brain computed tomography (CT) scans, time of symtom onset, time of arrival to the emergency department, time of stroke code activation, time of CT scan examination, and the time of recombinant tissue plasminogen activator administration were recorded. National Institutes of Health Stroke Scale assessments were performed before IVT bolus, at 36 hours, at either 7 days or discharge (which ever one was earlier), and at 3-month follow-up. Brain CT scans were done for all patients before and 24 hours after the treatment. Results: Stroke code was activated for 407 patients and IVT was done in 168 patients. The rate of functional independence (modified Rankin Scale [mRS] 0–1) at 3 months was 39.2% (62/158). The mortality rate at day 7 was 6% (10/168). Hemorrhagic transformation was noted in 16 patients (9.5%). 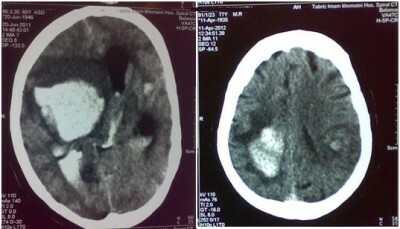 Symptomatic intracranial hemorrhage occurred in 5 (3%), all of which were fatal. One case of severe urinary bleeding and one other fatal case of severe angioedema were observed. Conclusion: During the first 4–5 years of administration of IVT in the hospital, it was found to be feasible and safe, but to increase the efficacy, poststroke care should be more organized and a stroke center should be established.